Delay in a marine adventure is an important and frequent phenomenon of maritime transport as it affects various parties and their interests. Insurance Law Implications of Delay in Maritime Transport is the first single book to deal specifically with this issue in the context of insurance law. The book　addresses the losses and expenses that may arise from delay or loss of time in maritime transport, the types of insurance available covering or excluding losses arising from it and the impact of delay on voyage policies. 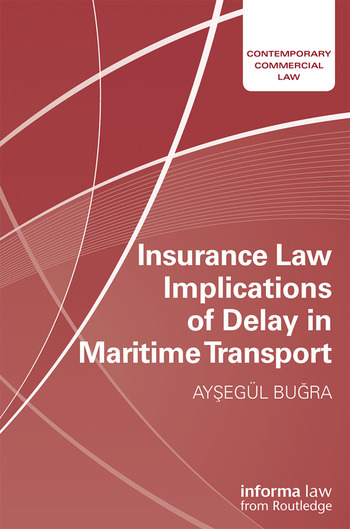 The author, Ayşegül Buğra, critically examines and evaluates the scope of several different types of marine insurance policies, including but not limited to: hull and machinery, cargo, freight, loss of hire and marine delay in start-up insurance. Furthermore, the book analyses the current law by tracing back the relevant common law authorities to the 18th century and examines the wordings used in practice from that time to today with a comprehensive and critical approach. This unique text will be of great interest to legal practitioners, shipping professionals and academics alike. Aysegül Bugra is a lecturer in Transport and Insurance Law and the director of Dr. Nüsret-Semahat Arsel International Business Law Implementation and Research Center (NASAMER) at Koç University, Turkey.